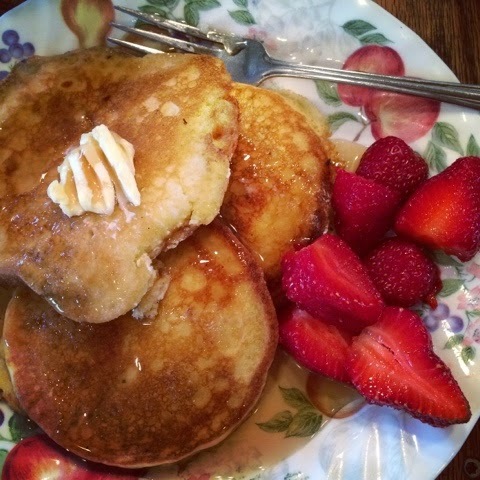 I know if you have followed my blog for any amount of time, you know my love for pancakes. I love pancakes in all shapes, forms, sizes, and usually all recipes. It's a deep love. I try to always start my pancakes the night before with my sourdough so it really gets the MOST benefits possible from the souring process. Well, sometimes that doesn't happen. Sometimes, I drop the ball and forget to start the sponge. It may not be the PERFECT sourdough pancakes, but the recipe I am going to share with you today is a GOOD recipe and you can still use your sourdough and get some good from it, even if it isn't all the benefits from the souring overnight process. Makes approximately 15 pancakes... give or take.